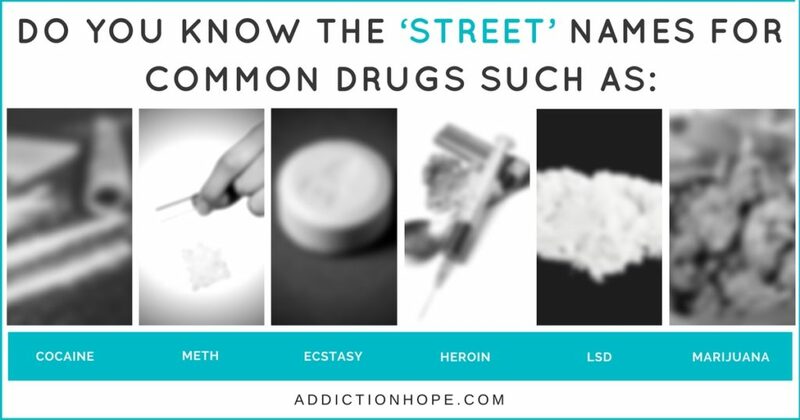 Why Are There Different Drug Names On The Street? This entry was posted in Substance Abuse and tagged Adolescents, Preventing Misuse, Stimulant, Trust on August 19, 2016 by Team Addiction Hope. Snow. Crank. Acid. Buttons. These words seem normal enough, but they actually refer to cocaine, crystal meth, LSD and psychedelic mushrooms, respectively. There is a wide world of street names for drugs, and they’re constantly changing. For parents especially, it’s important to recognize the alternative terms that people use to refer to common drugs. Even if you don’t have kids, you should be aware of the dangers that are present with illegal drugs and what they’re sold as. Some of the street names may sound silly, but don’t let the verbiage undermine the danger of these drugs. Such names are used in code among dealers for secrecy. The name must explain what the drug is, but make it sound normal enough to mislead authorities. Street names are designed to confuse the police and enable users and dealers to have conversations in public without seeming suspicious. Consider the difference between these two questions: “Did you smoke marijuana last night?” and, “Did Mary Jane visit last night?” Though Mary Jane as pot has become a commonly used term, you can see how one question is blatant and the other could easily be dismissed, even by an eavesdropper. A big reason many of these terms have become commonplace is through media and entertainment. Movies and music both expose people to the street names of drugs. Although this can help you learn a few labels, it also pushes those in the drug industry to keep shifting the names. This drug, also known as MDMA (3,4-methylenedioxy-methamphetamine), is most often associated with clubs and raves, especially because the dopamine it help release in the brain can simulate a feeling of connection between users. It is especially risky because the pills are generally less than 30 percent pure and can contain other serious drugs. There are several reasons why these chosen slang terms change over time. The primary reason is too much police attention. Once the names are no longer secret, it becomes increasingly risky to use them, whether it be in verbal conversation or through digital contact. Over-usage is another compelling factor for change. Switching the label for a drug can open new possibilities. Dealers may want to create excitement with their customers or even give the impression than an existing drug is something new entirely. Think of the rise of the term “Molly” for ecstasy. Dealers who give their product a unique name can also help distinguish it from the competition. Sometimes, street names become fully accepted. With lots of media and entertainment coverage, a term can stick with the public. Once it is “exposed,” the common term can be used to try to get everyone on the same page. “Weed” is a prime example, since it is one of the most enduring alternative names. Many people begin experimenting with drug as teens, just out of curiosity. Unfortunately, this can lead to addiction and a complete lifestyle change. Drug abuse, however, can be treated. With treatment centers and programs available across the nation, it’s easier than ever to get help for yourself or a loved one, although keep in mind recovery is difficult and never guaranteed. Are there new street names for drugs floating around that you are aware of? Please share them below. Knowledge is power when helping those struggling with addiction.